STG 7. 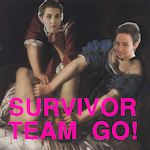 Conversation with Brandi | Survivor Team Go! Welcome back, Survivors! In this surprisingly chill and only slightly triggering episode of STG we talk with our pal Brandi about her experience at an eighteen day occupation of a street in front of a Minneaopolis police station, how life is better when you’ve got friends with you, and we may even convince her to play a song for us, who knows? You’ll have to listen to find out!